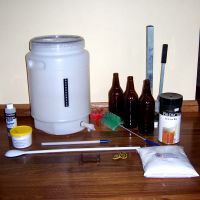 You can get a full home brew kit from any home brew store or even from some of the bigger supermarkets. The kit should include most, if not all of the individual items shown below. Depending upon the contents, I've seen prices range anywhere from around $70 to more than $300 for the more elaborate kits. One of the primary ingredients in the home brew beer making process. The tin contains a concentrated syrup derived from the raw beer making ingredients and will determine the style of the finished product. 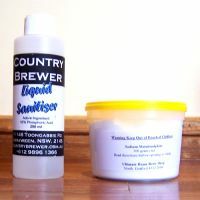 Along with the tin of syrup you will also get a packet containing suitable yeast to match the style of beer you are making. There are literally dozens of different styles and flavours to choose from so the sort you choose depends entirely on your personal taste. Prices usually range between $15 and $30. Not all sugars are the same. The style of the beer you are making will determine the sugar you should use. There are a huge range of different sugars suitable for brewing Some examples are Corn Syrup, Dextrose, Lactose, Light and Dark malt extract. 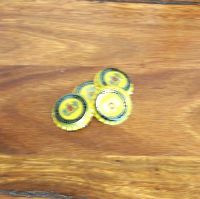 They come in both premixed packages targeted at specific beer styles or as seperate products for you to mix on your own. 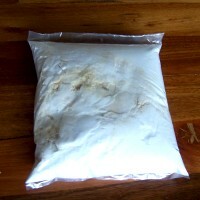 If at all uncertain which is the right combination for you, your homebrew supplier will be the best person to advise you on matching the brewing sugar to the beer you are going to make. Prices for sugar tend to start at around $4/kg and will vary according to the sugar variety you need. 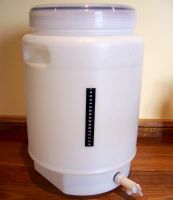 Basically the fermenting vessel is a plastic drum with an air tight lid, a tap at the bottom and a stick on thermometer on the side. The thermometer is an important part of the brewing process. Different styles of beer can have vastly different optimum temperature requirements. Something else to consider is that drum sizes can vary so be sure to match ingredient quantities to the size of your drum. Products designed to kill all unwanted bacteria from all of the brewing equipment that will come into contact with your brew. A device designed to allow the excess carbon dioxide produced by the fermentation process to escape without allowing outside air in. The air outside the drum is likely contaminated with natural bacteria that could interfere with or adversely affect the desired fermentation process. 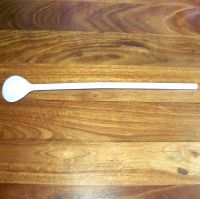 A spoon used to mix the brew ingredients. It does not necessarily need to be a spoon. The shape is not as important as the material it is made from. You should avoid wood or other porous material as it can harbor bacteria that can affect the fermentation process. 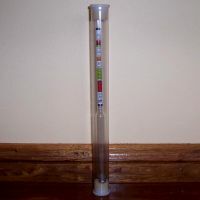 A hydrometer is a device that allows you to measure the relative density of a liquid compared to pure water. This is very useful in the brew process as it allows you to determine two very important things. First, you can see when the fermentation process is complete and it is ok to bottle the beer. Bottling beer to soon is a very bad idea as it can lead to bottle explosions. Second, it allows you to estimate the alcohol percentage of the beer you make. The benefit of knowing the strength of your brew are obvious. This tool is used to prime the bottles before filling them so that the end result is beer with bubbles in it. 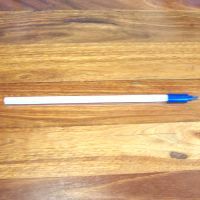 The tool that is shown has two ends, the large side is used to prime 750ml bottles, the small end is for 375ml bottles. 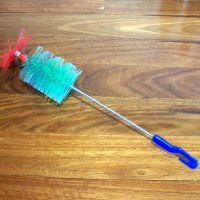 Simply used to clean bottles so that they may be reused. You can choose to either buy new empty bottles or just buy some beer and keep the bottles that it comes in. 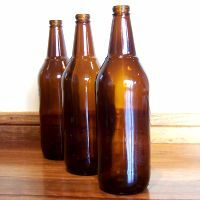 As exposure to light can adversely affect beer, brown glass bottles are best as they reduce the amount of light that comes in contact with the beer. If you must use clear bottles, you should store the beer in a dark place. This device fits into the end of the tap and allows you to fill the beer bottles from the bottom up thus preventing excessive foam build up and loss of beer. Used for sealing beer bottles. 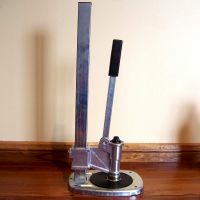 Used for pressing the bottle tops onto the top of the bottles with enough force to make an air tight seal. 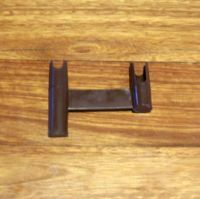 There are hand tools that do the same job but the lever action of the Capping press means that a lot less effort is required to achieve a seal.